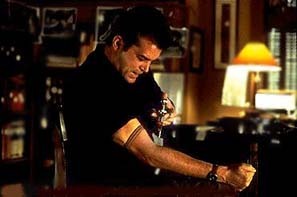 Ray Liotta makes me want to kill myself. Hello, world. Since you have arrived here, chances are good that you are looking for some Ray Liotta information, pictures or trivia, such as this... but instead through the magic of Google, you were directed to this page. Until tonight, you used to be directed to my old Ray Liotta page, the one titled "I blame Ray Liotta for my inevitable death." This, of course, was nothing but a goofy joke that I put up on my website when I first registered the domain foojang.com. Ray Liotta doesn't make me want to kill myself. I actually kind of like Ray Liotta, and think he's a fine actor... seriously! But I wanted to see if the dns was working, and slapped together something kind of nutty that I thought my friends might find amusing for about 10 minutes or so. 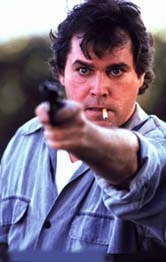 That night, back in early 2000, I had just seen about 2 or 3 Liotta movies which were not super happy movies, I am sure. I had always noticed his intense eyes, and christ, the couple of movies I had seen were sort of dreadful, so it was the first thing that came to mind. Then one day about 3 months later, I started getting a lot of emails from people telling me how much they hate me, and how I really should kill myself. Total strangers weighed in on how pathetic I must be, how I need to get a life, etc etc. How the hell did they find my site? One quick check at google answered that... my site was coming up #1 on Google and several other sites when searching for the name "Ray Liotta." Things got even darker than the occasional death-wish when it came to my attention that the page also came up first in a Google search for "I want to kill myself." Yikes! Shouldn't there be some kind of public service announcement for searches like that on Google's site? Maybe there are now. Ray was even told about this site in an interview on "the Screensavers" on tech-tv. You can see a clip of it here... the guy doing the interview calls me an "insane freak" or something like that. It's nice to be insulted on national television! So now after about 50,000 hits and 3 years or so I am pretty tired of this damn thing, and yet it is difficult to turn away from a top spot in the google rank, as completely absurd as that is. Hence, I've debriefed you all just now. Doesn't it feel nice and airy? Have a nice day. God bless Ray Liotta. 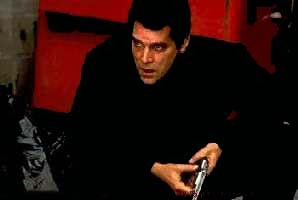 I blame Ray Liotta for my inevitable death. Yes Ray Liotta makes me want to kill myself. I am not sure why. He seems nice enough on the talk shows, but I feel dreadful whenever I see him show up in a movie. He reminds me of my mortality. Maybe it is the copious eye liner, but looking at him is like looking into a picture of my own slow death. Perhaps his roles are all too human, conjuring up images of the worst of humanity. But actually it is most likely the eyeliner. Several people have suggested to me that he may have tattooed eyeliner, which I never thought anyone ever did. But apparently it is the thing to do. I remain doubtful. But now I can't help but focus all of my energy on the eyelids... they are like a combination of every drunken morning I have had and the guy from A Clockwork Orange. It's weird, though, that I feel actual remorse for singling out Ray Liotta here. I mean, I feel gleeful in my hatred toward assholes like Garrison Keillor or Steve Allen, but I hate those guys for something more than their makeup. And I don't actually hate Ray Liotta, I am simply inspired to die because of him. Him, and his pale skin, red eyes and dark eyelids.